Brnardic, Vladimir. Napoleon’s Balkan Troops. (Men-at-Arms: 410.) Illustrated by Darko Pavlovic; Oxford, UK: Osprey, 2004. 48 pages. ISBN# 184176700X. Softcover. $14.95. I have over 100 books dealing with the uniforms of the combatants of the Napoleonic Wars. One of the major gaps in my collection is information on the troops of the Balkan Region. I have bits and pieces in a variety of sources, however I do not have one book that focuses just on them. Napoleon’s Balkan Troops fills this need. Napoleon’s Balkan Troops briefly covers the history of the French in the region, but then moves on to the troops itself. Mr. Brnardic breaks the topic into four parts: Dalmatia and Istria, Illyria, the Ionian and Seven Islands Corps, and Foreign Troops in the Illyrian Provinces. Each part examines the troops raised in the specific region, including their history – both in service of the French and elsewhere, their organization, and the various uniforms worn throughout the service. The text is well written and easy to follow. The uniform descriptions are nicely complimented by the color plates, which is the hallmark of the Men-at-Arms Books. A Voltigeur of the Royal Istrian Battalion, a Carabinier of the 2nd Dalmatian Battalion, and a Chasseur of the Royal Dalmatian Legion; all from 1806 – 1808. Troops in the Ionian Islands from 1808 – 1814, including the Albanian Regiment and the Septinsular Battalion. The color plates usually show both the front and sides of the uniforms, which permits the reader to see the detail of the turnbacks, collars, cuffs, etc. In the back of the book there is a 250 or more words of explanation for each plate. Each figure is discussed in detail, explaining the difference between what is shown on the plate and the text about the uniform in the previous sections of the book. In addition to the eight full page color plates, there are 30 black and white uniform plates from various artists – including many by Forthoffer and Malaspine. These are supplemented with 13 photographs of various uniform items, weapons, and even a fannion! I would like to commend the author for the maps he included. When I started to read the first page, I knew I was in trouble. He mentioned numerous locations that I was only vaguely familiar with, including such terms as Istria, Illyria, the Republic of Ragusa, and the Seven Islands. However, unlike many authors who assume the reader knows of the places that he is writing about, Mr. Brnardic made the correct assumption that the only the most ardent scholar of the Napoleonic Wars in the Mediterranean would know of these places. So on the second page of text he included a large map of the area that included such items as Military Croatia, the Illyrian Provinces from 1809 – 1814, the Republic of Ragusa, Dalmatia, the boundaries with the Ottoman and Austrian Empires, and the recruiting areas of the different Chasseurs d’Illyrie Regiments! Further in the text is another map showing the Seven Islands. This is a superb book. The writing style is crisp and to the point. It covers the topics in enough detail to satisfy the casual reader and the wargamer who is looking for uniform information. It also serves as a good reference book. The way it is laid out, combined with a table of contents and a comprehensive and accurate index, makes finding information very easy. 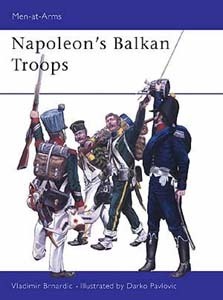 I strongly recommend Napoleon’s Balkan Troops to anyone with an interest in the Napoleonic Era.